The Institute of Arctic Biology at the University of Alaska Fairbanks (UAF) plan to conduct measurements for the first time – during the Montane Yukon Arctic Ultra 2015. Robert H. Coker, PhD is an Associate Professor at UAF and has over 15 years of experience studying the regulation of metabolism during exercise under a variety of different physiological scenarios. Dr. Coker will be working with Dr. Mathias Steinbach from the Center of Space Medicine Berlin who has now continued his collaboration with the organizers of the Montane Yukon Arctic Ultra. The participants in the study should be runners/cyclists/skiers aiming to complete the full distances of 100 or 430 miles and preferably be experienced. There are no age limitations, and he encourages women and men to participate in his study. These data will provide us the UAF with a greater understanding of the interaction between environmental and physiological stresses on the human body in a dynamic environment. If you would like to get more detailed information and/or participate in the study please email Dr. Coker at rcoker@alaska.edu as soon as possible. As some of you may have read on the Yukon Quest website, they have not yet made a final call as to whether the dog teams will start in Whitehorse or not. However, with the colder temperatures we are seeing now it is becoming more and more likely that both our races can start at Shipyard’s Park in Whitehorse. Gary also went with his ski-doo from Whitehorse to the overland trail last weekend and made there safely. He did encounter areas with overflow and with the warm temperatures we have had, overflow may be seen more frequently than normal. Therefore, I recommend all athletes to have a clear strategy as to what you do if you end up getting wet. Always have a dry set of clothing, fire starters in several places and be cautious. If we get to an overflow first and there is a way around it, we will re-mark. The problem is that overflow is often unpredictable. It may be a problem for some athletes and perfectly fine some hours later – if it froze again. I have no detailed updates on the situation on the rivers, yet. I hope with the fresh snow it will all become a bit smoother. Another thing to keep in mind that there is always a chance for fresh snow. It will make moving more difficult and it may also make it challenging to find the trail until we get there again. If you are not sure where to go, I recommend waiting for other athletes or wait for trail crew. Do not push the help button on your SPOT! As it will mean to us you are lost of injured and your race is over. Obviously, not being able to move or being uncertain about the trail is very hard on one’s nerves. But please be patient and keep in mind that nobody can do anything about the weather. If it does snow we will try hard to travel all the trails you are on asap. If you do have snow shoes, take them along. Should the weather forecast not predict any snow you can still leave them at your hotel or deposit them in a drop bag further north. The weather change right now also is a reminder that we do get very cold temperatures. Therefore, make sure your sleeping system is up for the job. Keep in mind that the Extreme Temperature Rating on your sleeping bag is not really what matters for a good night’s sleep. Only at temperatures around the comfort temperature range will you not be cold. Therefore, you should have a good sleeping mat, use a good liner and bivvy bag. Try to only sleep in places that protect you from the elements and do not rest in cold spots (rivers, lakes). With this information Trackleaders.com can add you to the system that is set up for the MYAU and we and everybody else following the race will have you on the “radar”. All athletes who rent a SPOT as always need to bring their own batteries to run the devices. You will need 4x AAA Energizer Lithium Ultimate (model # L-92). The SPOT will NOT work with regular alkaline batteries! Trackleaders.com does recommend a back-up set of batteries. I know these are expensive batteries but they last significantly longer than other batteries (especially in the cold) and also work with many other products like headlamps, etc. Trackleaders.com have also offered to upload a photo that will show when people click on your tracking symbol. If you want that, please email a 150 x 150 pixel close-up portrait photo of yourself to Matthew at heymatthewlee@gmail.com. Please send him your full name, distance and race bib number (which is the number you have on the race roster). I am still missing a lot of originals from paperwork. For those of you from outside of the EU that’s find. Please bring it to the Yukon with you. Athletes from within the EU who have missed the message and still need to hand in originals, please bring these now to the Yukon with you, too. Otherwise, your papers will end up in Germany while I am already in the Yukon. VERY IMPORTANT: I need the MYAU Medical Certificate signed from a doctor from all ultra distance athletes. General medical certificates do not count. A start without a signed MYAU medical certificate is NOT possible. 17:00 – 18:00 Hand-Out of the rental gear and fuel, Coast High Country Inn. If you can’t be there during that time please leave a message for me at the front desk of the hotel or contact me beforehand and we will arrange for a different time. Please note that the location for the indoor part of our training course has changed to the Gold Rush Inn. The timing for the training course has been updated, too. Also, please note that I have included the hand out of Primus fuel on several occasions. It is still a bit early to say anything reliable about trail conditions. But it does look like there is a good chance trail conditions will be challenging. The Canadian Rangers who do all the hard work on the Quest trail were out this last weekend. I hope to get some feedback soon. The main problem seem to be the rivers. A lot of jumbled ice and lack of snow make up for a bad mixture. However, we have had perfect trail conditions before and then one week before the race it all went „bad“. It can still snow and colder temperatures can still have an impact. I will keep you all up to date as I get the news. I wish all of you a Happy New Year and many great adventures in 2015! The Montane Extreme Smock is one of the first pieces of clothing that our title sponsor put into the market more than 20 years ago. 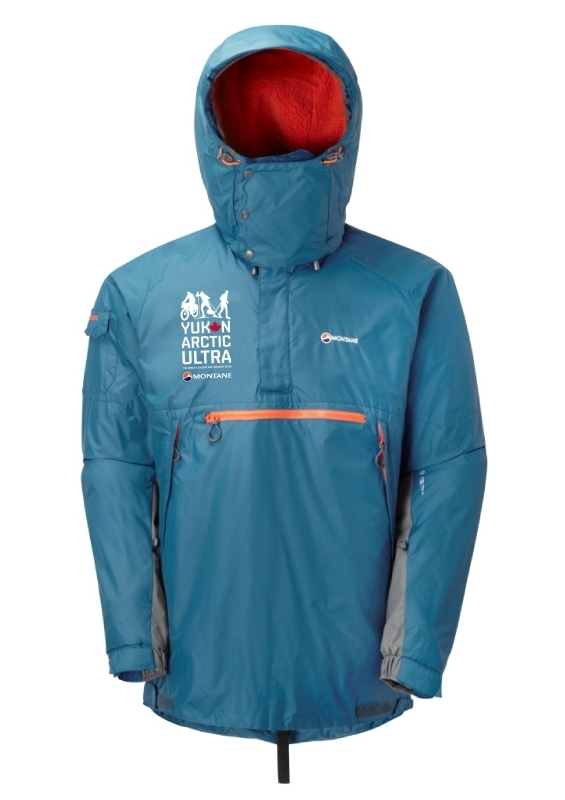 Since then it has proven in countless expeditions that it is perfect kit for extreme challenges in the cold. Over the years it of course has been improved and gotten even better. That’s why it is the first item that is sold with our brand new logo. Athletes can purchase the MYAU Extreme Smock with a 20% discount. The cost for the logo application is EUR 8.95. Anybody interested in purchasing one, please send me an email to info@thegreatoutdoors.de. Thanks to Peter Mild, owner of Peter Mild Design and MYAU 300 mile athlete, we now also have great looking logo patches. At the moment I have rectangular ones with different backgrounds. Within a week or two I should also get a round one. Prices are EUR 5.95/patch. I also still have some of the “Wolf Logo Patches” left. These now sell for EUR 2.95. As with the smock, anybody interested please send me an email to info@thegreatoutdoors.de. The meals at our checkpoints come from different places. In the cases of McCabe Creek and Pelly Farm we get the meals directly from our hosts. The lasagne and the hospitality at Pelly Farm are legendary. One more reason to make it there! And Kathy Kruse at McCabe Creek makes excellent meals, too. The size of the portions from the Deli are 16 oz (approx. 470 ml) each. So, if you only have a small cup or plate, please feel free to come for a second serving. In Braeburn you will eat from the menu. And it’s okay if you are hungry. They serve one of the world’s largest burgers. If you still are hungry after your checkpoint meal or you want to eat again after your rest, you can. Other meals are just not included in the entry fee. So, please take a long a bit of money. You may also want to check out their cinnamon buns. They definitely ARE the world’s largest. The meals for Ken Lake I need to confirm, yet. Our assistance point at Takhini Bridge, about half way to the marathon finish is only there for the marathon runners. No meals are served there but marathoners can get hot water and tea, to drink right there and to fill up water bladders or flasks. Indian River is an assistance point between Scroggie and Dawson. Again, there are no meals but a safe place in case of emergencies and a place where you get something hot to drink. Drop bags need to be handed in after the pre-race dinner. You do have until about 10 PM to give us your bags. So, you don’t have to bring them right to the dinner. You can finish packing after dinner and bring the bags then. Please note that the drop bags need to be packed really well. Do NOT use plastic or garbage bags. Also, the bags need to be clearly marked with your name, bib number and the checkpoint. Do not just put tape on the bag. This may work fine in a warm hotel room. As soon as the bag gets into a cold trailer, tape comes off. So, please keep in mind that the marking needs to withstand the cold and handling of the bags. The bags will be transported in an enclosed trailer. So, they will be in the cold for an extended period of time and they will be piled on top of one another. Therefore, please do not pack anything that can break easily or will be damaged by cold temperatures. Drop bags once used by athletes will not be transported north. When you are done with a bag it will be stored at that checkpoint and transported back on one of our trips to Whitehorse. If you need to stop your race at an earlier checkpoint we will try to get your bags which are further north to Whitehorse as soon as possible. All drop bags will be brought to the storage room of the Coast High Country Inn. I often get asked if checkpoints have internet access and electricity. The answer is: „It depends“. Internet you really only get in Carmacks. And there is only one computer. So, if many athletes want to use it at the same time, it may be a bit difficult. Electricity is available in more places, i.e. Braeburn, Carmacks, McCabe and Pelly Crossing. Especially at Braeburn availability may be tight when there are many athletes at once. In a few places there are pay phones. In Whitehorse you can get calling cards and then use these phones for very little cost per minute to call back home. Places with pay phones are Braeburn, Carmacks and Pelly Crossing. Of course we will also make frequent news updates and there is the SPOT tracking. So, friends and family have an idea where you are and how you are doing. I also often get asked if we provide a full GPS-track of the trail. The answer is „no“. Mainly this is due to the fact that the trail can change from one year to the next. And it even may change on short notice – due to overflow or other reasons. Athletes who are tired may make the mistake to follow their GPS rather than focussing on the trail ahead and the trail markers. If they do that, they can get into some very dangerous situations. It is still good to have a GPS, though. It can tell you at what speed you are traveling at. Which in turn will allow you to take a better guess as to when you reach a checkpoint, when to take a break, etc. Also, if you really do get lost, you can back-track with the GPS or find a way to a checkpoint (as we do have the co-ordinates for checkpoints). But please keep in mind that walking off a trail and cross-country to a checkpoint, certainly when it is still far away, should be your last resort. Don’t forget, if you do have a SPOT and even after a good rest you are sure you won’t find back to the trail, push the help button. With Coast Mountain Sports there is a great outdoor and sports store in down town Whitehorse. Many athletes go there every year for some last minute shopping. If you need something specific like Neo overboots, snow shoes, larger quantities of expedition food, etc. it makes sense to contact Coast Mountain Sports as soon as possible. That way they have a chance to order missing gear in time for the race and reserve it for you. Your contact there is Corina Zumer (corina@cmsyukon.ca).